Being a Toronto wedding photographer gives me access to many splendid photography locations. Very few marriages were as beautiful as this Black Creek Pioneer Village wedding. This opening album spread includes three wedding photos taken while the bridal party in the guests were in another room enjoying the big day. The image on the left, captured at the beginning of the wedding day, shows the white dress hanged by the window. The second shot features the bridal bouquet. Finally, the last image presents the bride and groom's wedding bands. 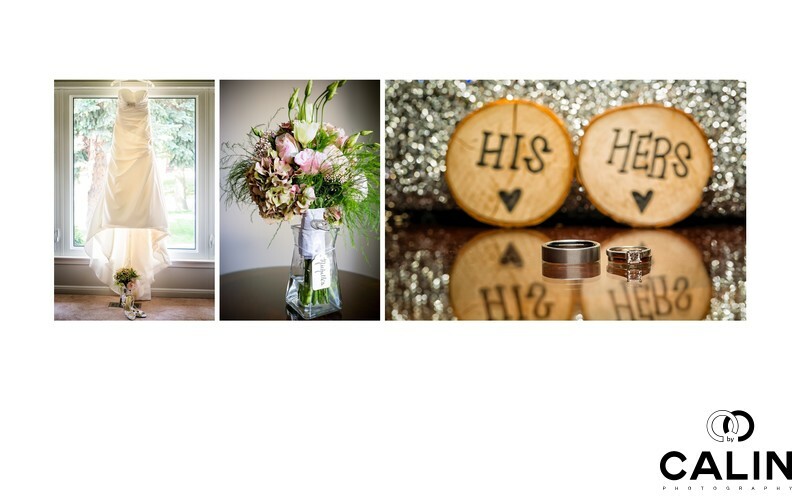 The wedding dress, captured in the left photo, is one of the key elements of any wedding. As such, it is my duty as an artist to photograph it properly. In this case, I placed the dress by the window. Next, I made sure the dress is in the middle of the frame. Why so? A central composition gives the photo room to breathe. Finally, under the dress, I placed the shoes and the wedding bouquet. While I prefer spending time photographing people to objects, I realize that in wedding photography everything is important from the bride shoes to pictures of the wedding venue are the banquet Hall depending on the situation. I find that one can capture some of the best emotions during the wedding ceremony and the reception. This rustic wedding had it all: laughters and tears during the ceremony and the wedding reception and a lot of fun during the evening when everybody went to the dance floor to enjoy the big day and have the time of their lives. The bridal bouquet is another central element of the wedding details and it was captured in the second photo. The vase features a label with the brides' name. To draw viewer's eyes' into the image, I added a vignette to the bouquet. Finally, the last photo of the spread features the couple's wedding rings. To add an element of interest, I created a reflection by placing them on a glass table. Even more, behind the rings, I placed a glittery purse from one of the bridesmaids. The bokeh gives the image a dreamy look.